The week has been chock full of stories that unfortunately I can’t even remotely write about. Although some of my experiences are universal and could happen almost anywhere, sometimes I run into situations that I can’t imagine happen more than once. I’m pretty good about writing them down, though, in the hopes that I can change them up a little bit and use them in the future. If nothing else, this week I have gotten a lot of practice in trying to maintain my composure when I literally wanted to laugh out loud. I’ve also made good use of my skills in talking executives off the proverbial ledge when they’re ready to jettison staffers, building hope that with hard work and thorough follow-up, we can turn things around and prevent further casualties. One thing I can talk about is my work with customers who want to work on population health projects. The first thing I do is a run a working session called “What is Population Health” that forces the organization’s leaders to come to terms with the fact that it’s often ill-defined, and even more so given the fact that everyone around their table has a different idea of what they think they need. Plenty of people still think they’re going to be able to buy a single technology solution that’s going to deploy itself with minimal input. These are the folks that also think that these are IT projects rather than clinical and operational ones, and who are generally surprised when I explain that it’s going to take a village to get them done and that no one is going to be allowed to abdicate their responsibilities. My clients often complain about their software vendors, demanding more bells and whistles than what exists in current general release versions. In my experience, many customers are using only a fraction of the tools they’ve already got, and sometimes the continued banter about future content is just an excuse to avoid dealing with current-state problems. One of my clients had been fighting with a vendor about their ability to create complex reports to identify certain sub-populations of patients. In reality, the client wasn’t ready to handle even the simplest of population health work flows and refused to admit it. They need to spend a lot more time looking at their staffing and deciding who they want to be as a practice before they start outreach and disease management programs. For starters, they have to deal with their six-month appointment backlog and their insane phone volumes. Until they address those issues, they can’t handle more patient visit volume or consider offering non-face-to-face visits. I love a good challenge, and the groups I’m working with right now are unlikely to disappoint. Although they require the kind of long-term consulting that’s going to need not only my partner and me but some contractors to execute, some of the help they need is of a more routine nature. I’m never surprised by how many organizations lack the basics, such as communication plans, service level expectation agreements, and other types of policy and procedure documentation. There are different ways to approach dysfunctional organizations. Sometimes it needs to be done from the top down, sometimes from the bottom up, and sometimes you just want to implode the whole thing and start from scratch. Figuring out the best way to approach it given an organization’s culture and leadership is sometimes more of an art than a science and sometimes it’s frankly voodoo. The week has also been full of non-work laughs, with the best occurring at my home airport, recently made infamous by a viral video about their TSA lines. Fortunately, I had TSA PreCheck, so I was in a shorter (yet still long) line when my companion and I observed a woman with a hula hoop trying to cut the line. She started all the way at the back of the regular line and just kept working her way past passengers until she got to the first airport employee who was sorting the PreCheck passengers from those with regular clearance. She was slurring her speech, explaining that she was going to miss her flight and that she needed to get to the front of the line with her friends. Although the agent stalled her for a bit, eventually she was let through. By now plenty of people were watching the spectacle from all four or five lines that were snaking their way towards the actual TSA agents. She was just shoving past people by this point, with no one stopping her. Whether they were worried about getting into a confrontation with someone who was possibly impaired or disturbed or something else, most of them stepped aside as she pushed past, thumping passenger after passenger with her hula hoop slung over her shoulder. Most of us in the PreCheck line were waiting for TSA to send her packing, but were surprised that they let her through. This circus was a stark contrast to my experience at another airport recently, where my friend was forced to check her bag because it was slightly non-rectangular, having been crushed on an earlier flight to the point where it exceeded the bag-sizer’s dimensions by half an inch due to its skewed shape. 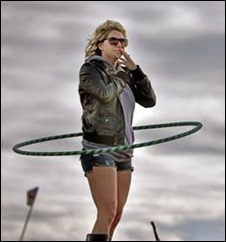 At that airport, they were examining bags before people were allowed in the security line, vs. my recent experience where the hula hoop was allowed through. I’m pretty sure a hula hoop fits neither in the overhead compartment nor under the seat in front of you, so I wonder what they did with it on the flight. Regardless, it was good to have some diversion before I boarded a flight where I knew I’d be immersed in the exciting world of QRUR reports, which require a 20-page document to explain their contents. I envy the travelers that board with a stack of magazines or their headphones and eye mask. Those magical minutes during takeoff, taxi, and landing before I can fire up my laptop and get to work are always good times to reflect on the week ahead or behind, depending on which way I’m heading. I chuckled to myself as I thought of one client leader who still can’t figure out how to pronounce my name despite multiple onsite visits. One of his colleagues told me they play a behind-the-scenes game to see how he’ll mangle it next. Someday I’m going to write a book, and it’s going to center around the fact that you can’t make this stuff up. What are the craziest things you encounter during your work day? Email me. I just love your stories and so wish to hear the ones you can’t relay! Great stuff, as always.